In 2003 Ford developed a specific tank for the 03 and 04 Mustang Cobras. This tank looked like a normal tank from the outside, but featured one of the finest internal baffling systems we’ve seen from an OE tank to date. In late 2011, Ford decided to discontinue these tanks. At Aeromotive, we saw and opportunity to reproduce these tanks. Not only can we offer reproduction 03-04 Cobra tanks, but we can also modify the tooling in the production process to offer this same tank to fit all Fox Body Mustangs. And that is exactly what we did. But we took it one step further. We built specific A1000 and Eliminator Fuel Pumps that bolt right into top of these tanks. Then, we built a complete system to make it one part number that gives you everything you could possibly need to install a complete Aeromotive Fuel System into your Fox Body. These Fox Body Stealth tanks give you the best performance possible from a stock appearing tank, and our proven A1000 or Eliminator fuel pumps built right into the tank. Choose from either pump and you can now bolt in a fuel tank into your Fox that appears stock, but features an innovative baffling system, a built in fuel pump capable of supporting almost any hp demand and a pre-pump filter. 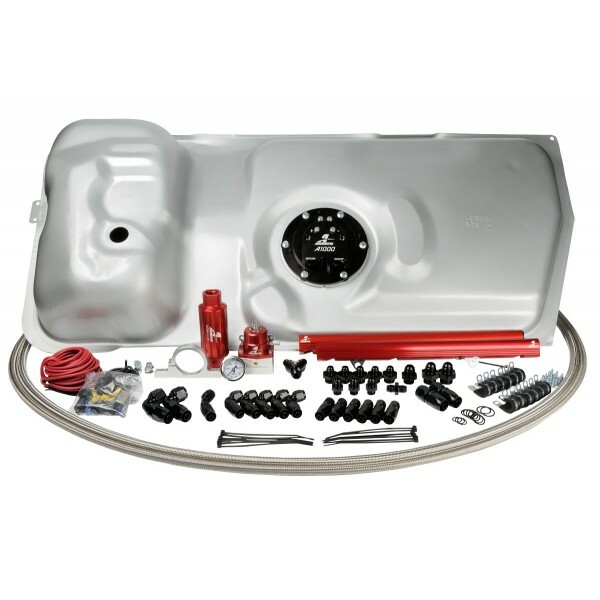 These tanks and systems are a direct bolt-in for 1986 – 1998 ½ Ford Mustangs. Although the Fox Body began in 1979 and carried all the way through 2004, some modifications are necessary for these system to be direct bolt-ins. See notes below on year specifications. - Built in A1000 Fuel Pump - 100-Micron Stainless Steel Pre Filter - (1) ORB-08 Outlet Port & (1) ORB-08 Return Port - Bolts right into factory location using factory tank straps Includes: - P/N 13109 - EFI Bypass Regulator - P/N 12301 - 10-Micron Post Pump Filter - P/N 12305 - 2" Billet Filter Bracket - P/N 14101 - 86-95 5.0L GT & Cobra Fuel Rail Kit - Complete Fuel Pump Wiring Kit - All of the necessary port fittings - Enough AN-08 Fuel Line and Hose-Ends for a complete and total installation In 2003 Ford developed a specific tank for the 03 and 04 Mustang Cobras. This tank looked like a normal tank from the outside, but featured one of the finest internal baffling systems we’ve seen from an OE tank to date. In late 2011, Ford decided to discontinue these tanks. At Aeromotive, we saw and opportunity to reproduce these tanks. Not only can we offer reproduction 03-04 Cobra tanks, but we can also modify the tooling in the production process to offer this same tank to fit all Fox Body Mustangs. And that is exactly what we did. But we took it one step further. We built specific A1000 and Eliminator Fuel Pumps that bolt right into top of these tanks. Then, we built a complete system to make it one part number that gives you everything you could possibly need to install a complete Aeromotive Fuel System into your Fox Body. These Fox Body Stealth tanks give you the best performance possible from a stock appearing tank, and our proven A1000 or Eliminator fuel pumps built right into the tank. Choose from either pump and you can now bolt in a fuel tank into your Fox that appears stock, but features an innovative baffling system, a built in fuel pump capable of supporting almost any hp demand and a pre-pump filter. These tanks and systems are a direct bolt-in for 1986 – 1998 ½ Ford Mustangs. Although the Fox Body began in 1979 and carried all the way through 2004, some modifications are necessary for these system to be direct bolt-ins. See notes below on year specifications.